Tuning the Body of Christ | GetAlongWithGod.comGetAlongWithGod | A blog about discovering a God worth knowing. After reading Jennifer’s post yesterday I had a flood of revelation come to me. 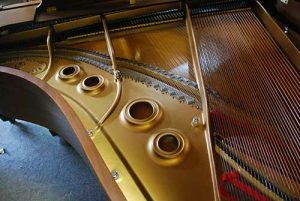 I started to see the intricacies of God’s Body through the workings of a grand piano. And although I’ve not yet seen the documentary Jennifer wrote about, I will certainly see it soon. My grandmother played piano professionally and used to have a grand piano in her living room. When I was a small child, I remember sitting under it while she played. From that vantage point, the vibrations coming from it was like sitting under a thunderous storm cloud. I also recall that I enjoyed gazing inside of the piano while she played. I loved watching the hammers hit the strings and seeing them vibrate. Although I never learned to play myself, I did appreciate the intricate workings of a piano. This morning what I began to see is that when our individual lives are not tuned to the ear of the Master Tuner (the Holy Spirit), we bring discord. Obedience to the Life of the Spirit brings harmony in the Body, but when we are functioning independently and out from the Spirit, we are out of tune. Unfortunately, a single note that plays off key can ruin the entirety of a song. A symphony is when every note played is in sync with the conductor’s direction. Random tones or happenstance notes will only destroy the whole of the piece of music. In the same way, when the Spirit leads our lives, God conducts our corporate living into a symphonic masterpiece together. On the other hand, discordant living is just like that off-key note that spoils the entire piece and draws attention away unto itself. Oddly, the professional tuner might be the only one who can hear the slightly off-key note. It might be imperceptible to the untrained ear. But as a professional tuner, they can hear it and tune it. In the same way, the Spirit is aware of and will address off-key Christians. And once they are set right, the music of Body Life can bring forth life-giving melodies. As a final note, there’s a misconception about unity in the Body of Christ. Often we believe unity is found when we are unified by purpose to one another. This doesn’t work with the Body of Christ or with a grand piano. If keys are tuned based on each other, everything could be just a bit off. It would be like a game of “I’ve got a secret!” Each whispered note could add a little, creating an off-key result. 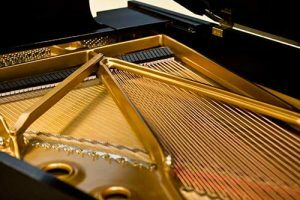 Unity in the Body of Christ or in a fully tuned piano happens by being tuned by the Master Tuner, and then being unified with the Conductor of the orchestra. We are not in unity when we’re unified with each other; we are only unified when we are each in unity with the Maestro, who is making masterful music of our lives. “We are not in unity when we’re unified with each other; we are only unified when we are each in unity with the Maestro, who is making masterful music of our lives”. Yes, I totally agree. I am often grieved in my heart over this, I have to admit. Read this morning in Proverbs 2:2 NLT “Tune your ears to wisdom and concentrate on understanding.” You, Jennifer and Martha are tuned in…….Martha gave us the picture of our Faith being a gift from our failure and you joined Jennifer in making “beautiful” (Tammy) music from the Master Tuner, to become an orchestra of bringing in the Kingdom . This is so encouraging because as John posted, “we are HIS workmanship”!!!! !